The Enhancer produces a powerful spark with increased spark duration. 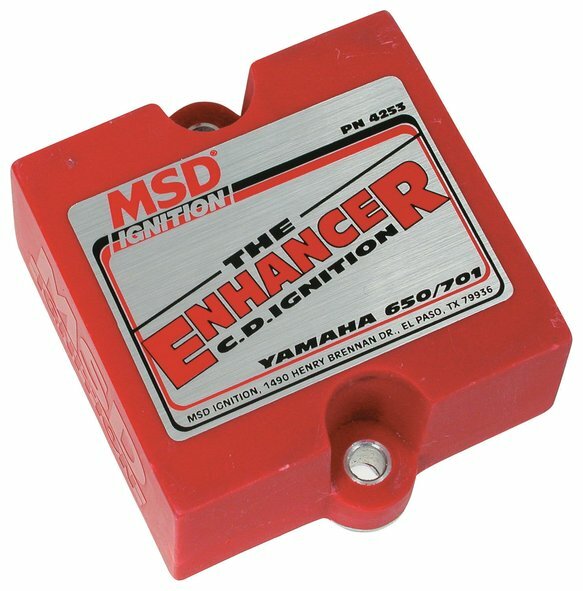 If you own a Yamaha with a 650 or 701 engine, this Enhancer is a necessity! The Enhancer produces a powerful spark with increased spark duration. Not only does the improved spark energy boost power, but this Enhancer features a more aggressive timing curve for even more power to get you going! At lower rpm you'll notice incredible acceleration and throttle response due to advancing the timing. Then as the rpm increases, the timing is retarded to the factory setting to prevent detonation and engine damage. For racers, there is also a lower rpm limit that you can activate for quick and consistent holeshots. By activating a switch mounted on the handlebar the rpm will limit at approximately 3,000 rpm. The instant the button is released, the rpm revs up just as normal and you rocket off. Everything you need to install the Yamaha Enhancer is supplied along with factory connectors for a direct plug-in installation! High output sparks improve throttle response, starting and top end power. Factory style connectors for a direct plug-in installation. Bolt in place of the factory ignition.